My kids were 3, 4 and 6. We were packing and preparing for our first camping trip in our new tent. With the help of little hands, I’d packed our camping gear into my white Plymouth Voyager. With bug spray, sleeping bags, and our pie irons packed and ready, there was little to do but wait for my husband to arrive home from work. The kids were so excited they were beyond waiting patiently. And as little ones often do, they questioned me over and over “Mommy, when will daddy be home so we can go camping?” It seemed like the longest day ever. My husband arrived home to barely concealed screams and squeals of excitement. The short hour and a half drive to Deer Creek State Park seemed to take an eternity as we fielded more questions from the back seat. “Are we almost there?” “How much longer?” “What are the marshmallows for, mommy?” Their excitement was hard to match. We drove through the parking lot and found the perfect location. A wooded site that set slightly downhill from our parking spot, a short distance from the bathhouse. The last thing I wanted to do was wake up in the middle of the night and walk a sleepy child to a bathhouse 15 minutes away to use the restroom. We set up camp and took a short walk with the kids on one of the nearby trails. We’d just made it through dinner and began roasting our first marshmallows when the blue skies turned ominous, and we heard the first roll of thunder. We hunkered down in our tent, spread out on our air mattresses as I read aloud from a Thornton Burgess book , trying to ignore the storm that raged outside the flaps of our tent. It wasn’t long before the ground was soaked in the torrential downpour and rain began to pour into the bottom of our tent. The initial excitement of our camping adventure had ended. I’d love to say that our camping trip improved. Sadly we found ourselves packing up early after two days of continued rain showers and headed home. Our camping adventure had ended. 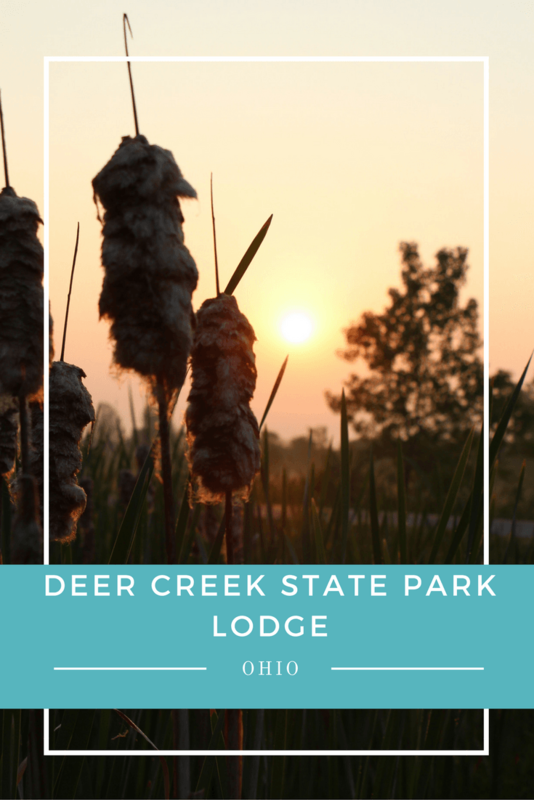 That was my last experience at Deer Creek State Park and though it wasn’t the fault of the park, after that experience, I had no desire to return. Until recently. 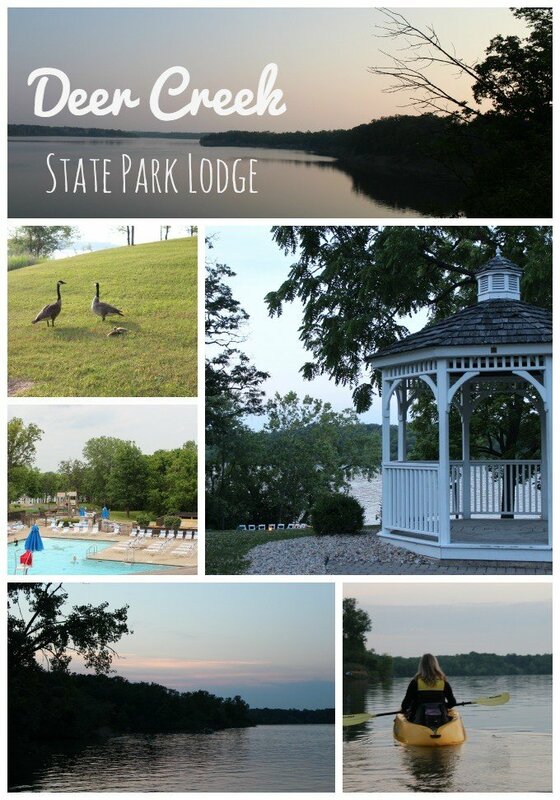 I was invited to check out the Deer Creek State Park Lodge on a recent press trip. What a difference a lodge can make. The lodge, built in 1981, offers comfortable accommodations nestled in a gorgeous scenic setting. 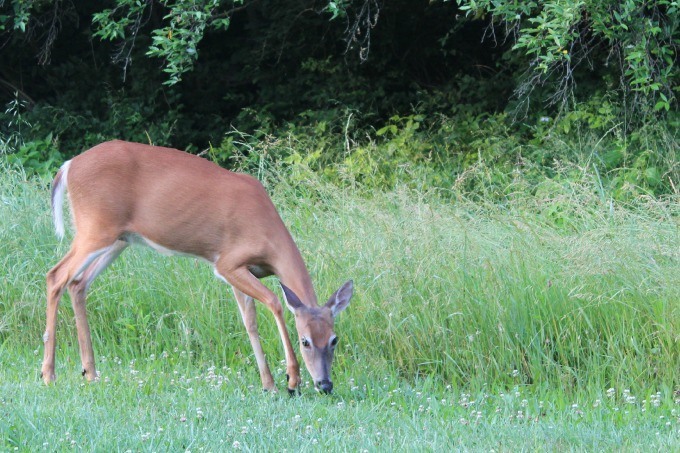 Deer, raccoons, herons and Canada geese are plentiful on the grounds. The tastefully decorated rooms are comfortable and offer nearly all the comforts of home. 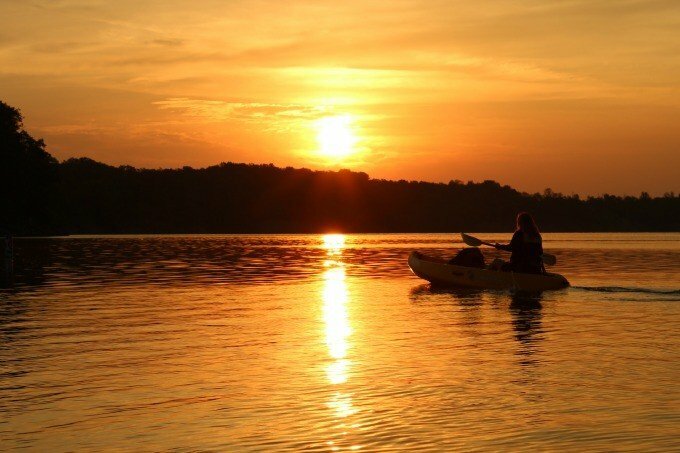 You’ll find plenty of options for outdoor activities- boating, kayaking, paddle boarding, fishing, bike riding, geocaching, horseback riding, swimming, hiking, and even shooting. But if inclement weather threatens your getaway, you’ll find indoor activities- a sauna, pool, arcade style game room, and kid’s activities to tide your family over until you can get back outdoors. The lodge provides plenty of public seating areas, and the rooms have balconies or small patios that provide a nice place to sit and relax for a few minutes, enjoying the view. Guest rooms are equipped with a mini-frig and microwave, but if you tire of food you just heat up, pop into Rafter’s Restaurant just off the lobby. Specializing in Ohio raised chicken, beef, and pork; this restaurant serves up some tasty morsels. I ordered the Stuffed Chicken Roulade and was not disappointed. If you prefer to camp at Deer Creek, you’re not limited to camping in your tent. 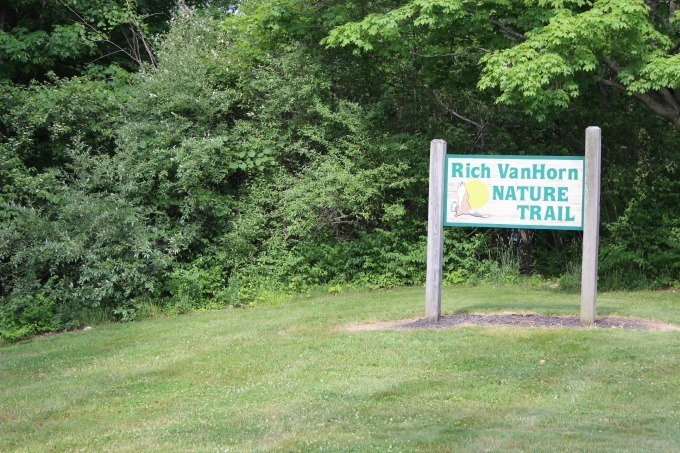 You’ll also find RV spots, lakeside cottages, and the historic Harding Cabin. I’m a sucker for historic properties so I’d like to return to stay in the latter. 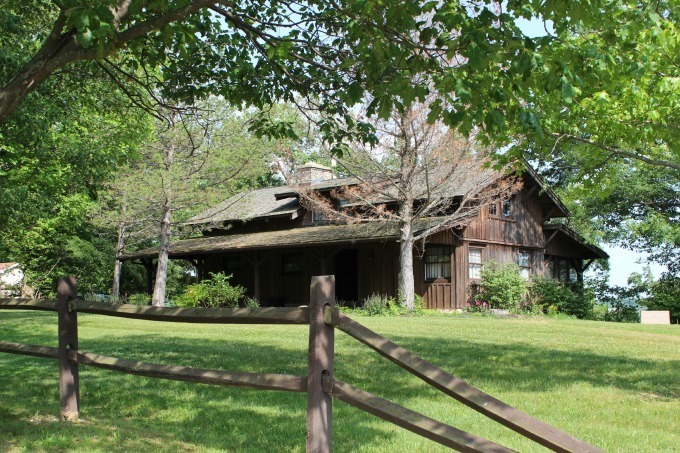 Once frequented by President Harding, this small three-bedroom cabin has been upgraded with modern conveniences while retaining its rustic charm. Located in Central Ohio, about thirty minutes south of Columbus, the small villages and towns of Ashville, Mt. 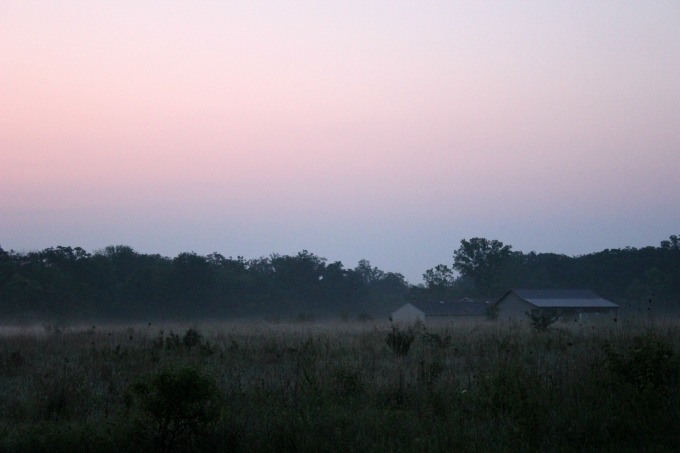 Sterling, and Circleville are near enough to explore when staying at the lodge. Home of the Circleville Pumpkin Show, which draws crowds of 400,000 people each October, Circleville is also the location of Wittich’s Candy Shop. 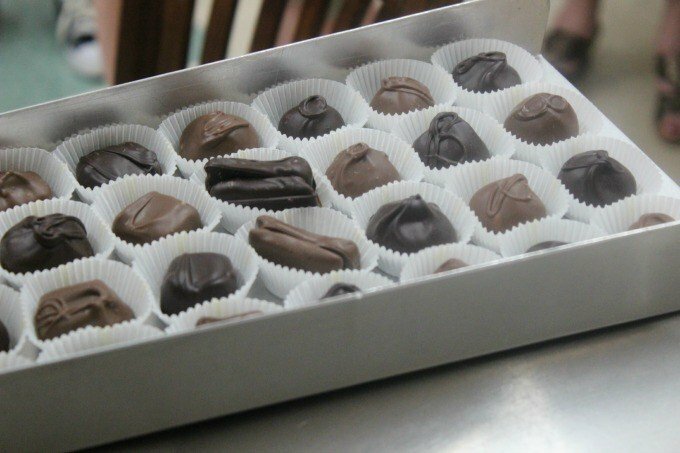 This local candy shop is thought to be the oldest confectionery in the country continuously owned and operated by the same family. A walk along Main Street will lead you past Lindsay’s Bakery, famous for the World’s Largest Pumpkin Pie, the Ted Lewis Museum, which celebrates the life of this small town hero, and interesting architecture and beautiful murals. I’m eager to return to explore further. Just south of town stands Mt. Oval, a charming historic property, once a private residence, the home and grounds were gifted to the Pickaway County Historical Society. 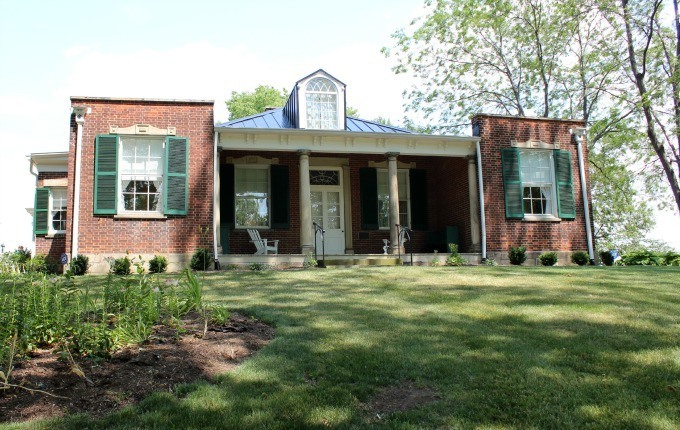 Listed on the National Register of Historic Places, this property is fashioned after Thomas Jefferson’s garden house at Monticello. I may have left disappointed the first time I visited Deer Creek State Park, but I certainly wasn’t the second time around. I anticipate many more stays at this Ohio State Park Lodge. Disclosure: A special thank you to Xanterra Parks and Resorts, who manages five of the Ohio State Park Lodges, for hosting me during my stay. We were in a tent when we visited Deer Creek for the first time. You read how that experience went. 🙂 I do love exploring Deer Creek and Ohio’s other state parks. Love Deer Creek Park! Thanks for the article and pics. Wow. It sounds like you have amazing memories of Deer Creek. Thank you for sharing your family’s story, Jessica. Thank you for sharing Deer Creek with the rest of us, so we can make memories there as well. Love that you shared your early memories of visiting the park too! Great pictures – this looks like a wonderful place to visit! I can’t wait to go back. Ohio has some pretty amazing state parks to explore. Looks like a great place with lots of options. We don’t enjoy camping as much as we wish we did, so it’s always nice to have a comfortable alternative like the Deer Creek State Park Lodge. Glad your second trip was an improvement! Love that you can see so much wildlife there! I will have to keep the confectionery on my list! I enjoy visiting places that allow plenty of down time to explore and get out in nature. I left feeling refreshed. Glamping! My favorite kind of camping. This sounds amazing and like such a great family getaway! Beautiful photos, this place looks like a very fun spot to get in touch with Nature! That place looks so peaceful and calm! I’d love to visit! What a timely post! We are just starting to plan our Ohio vacation and this lodge looks ideal for us. Did you see my Ohio Bucket list? I offer a lot of ideas on exploring Ohio. If you have any questions, let me know. Enjoy your trip!